Because of Back-pull out structure, Impeller and bearings can be easily removed without disturbing motor or piping. Designed from many years of experience, UGS has stable characteristics with high efficiency and small NPSH over the wide range of performance, and promises quiet operation. High interchangeabilities of parts construction. 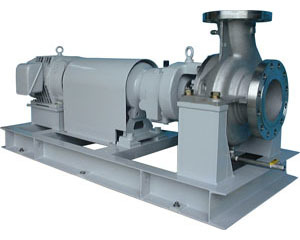 For cast-iron material the pump model is UGF. When pumping temperature exceeds 80ºC, cooler shall be provided. Water jacketed bearing housing is available when temperature exceeds 120ºC.